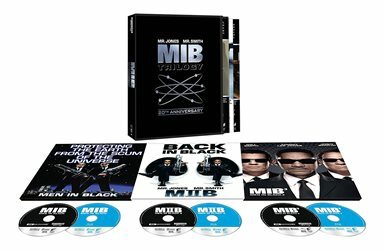 This 4K UHD release is the best possible versions of The Men in Black Trilogy and for any fan of the series, this is one set you don't want to miss out on! There are many people who believe there are aliens out there in the universe and some who think they live amongst us. There are also people who believe there is a secret government agency covering up the existence of aliens. Nineteen ninety-seven's comedy and subsequent sequels take a humorous look at the idea that both aliens and a government secret agency do exist. Men In Black introduced us to a group of men who silently move through our society keeping all of us blissfully ignorant that creatures from other worlds live on Earth. Sony, in their infinite wisdom, has now released all three films on 4K Blu-ray and this box set offers hours of entertainment for fans of the trilogy. In Men in Black Jay (Will Smith; Ali), a New York City Police Officer discovers and becomes recruited by the above-mentioned agency who monitor alien life on Earth. He is partnered with veteran agent Kay (Tommy Lee Jones; The Fugitive) who shows Jay the ropes while dealing with a "Bug" (Vincent D'Onofrio; Full Metal Jacket) who has entered Earth illegally. Through the process Jay has his eyes opened to what is really "out there". In the end, they end up saving the Earth luckily. Men in Black II has Jay and Kay's replacement once again saving the World. As they investigate the murder of a pizzeria owner, they find out Serleena (Lara Flynn Boyle; The Practice) is searching for something called the light of Zartha. As Jay investigates he realizes everything about the light of Zartha points back to his old partner Kay who was neutralized and doesn't remember anything about aliens or MiB. As they begin to unravel the mystery, they realize the light isn't a what but a who and convince her to return to her planet to save both her world and theirs. As the Trilogy comes to a close, Men in Black 3 gets Jay to travel back in time where he meets a young Kay played by Josh Brolin (No Country for Old Men). This time an alien named Boris (Jemaine Clement; What we do in the shadows) escapes from prison on the moon to find K who captured him in the first place. Jay also discovers that back in 1969 Kay deployed "ArcNet" that is a shield protecting Earth. Boris goes back in time to kill Kay and prevent not only his imprisonment but ArcNet as well which would alter the course of history. Of the three films, I think the best is the original with a close second being the third installment in the trilogy. Adding Brolin to the mix gave the latter an interesting feel and Brolin does a great job in Men in Black 3. Smith and Jones have an easy and chemistry which makes the whole series work in general. Supporting characters add another dimension to the movies with D'Onofrio being the best of the bunch as "the bug in an Edgar Suit". Sony has produced an amazing transfer for this 4K UHD version of the Men in Black series. The picture is sharp but still has a little bit of a grainy quality (some was kept since it was shot on film) All of this terrific work completely maintains the look that director Barry Sonnenfeld (Get Shorty) had envisioned for the series. Colors are spot on and vibrant. Blacks are true and dark, and there is zero sign of artifacting. The Dobly Atoms soundtrack only further enhances the quality of this release. Dialogue is crisp and clear, while the special effects truly envelop the viewer. This is truly a demo quality release. Aside from the digital code that will play on most services using Movies Anywhere, there are a plethora of special features however that are recycled from previous releases that can be found on the standard 1080p Blu-ray including in the release. Special features include deleted scenes, alternate endings, audio commentary, various featurettes, and music videos. Besides a great cast and some good plots ( for the most part), the Men in Black Series offers an eclectic soundtrack and an easily recognizable theme song. Smith is in his wheelhouse with this series and the juxtaposition between him and the two more serious Jones and Brolin make for a terrific and fun mix. This 4K UHD release is the best possible versions of these films and for any fan of the series, this is one set you don't want to miss out on! Download Men in Black Trilogy from the iTunes Store in Digial HD. For more information about Men in Black visit the FlickDirect Movie Database.